The geostationary meteorological satellites of Japan have been nicknamed as "Himawari" but we also have a period when the name was not "Himawari." This page summarizes information about recent geostationary meteorological satellites. For your information, satellite images are accessible at Digital Typhoon and Images and Movies of Himawari-8 / Himawari-9 - Next Generation Weather Satellite. Those meteorological satellites are located in different positions and equipped with sensors with different characteristics as shown below. We also provide related information in the page of Typhoon 200303, which was happened to be active at the time of the switchover. Coverage images were made from the Blue Marble Data. 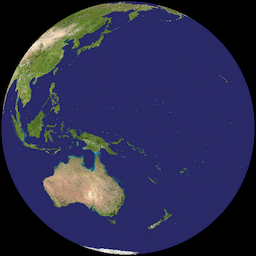 The successor of Himawari, MTSAT-1R, was launched successfully on February 26, 2005. The real-time report and other technical information was provided at MTSAT-1R / H-IIA F7 Countdown. Also I reported the launch from the site on the weblog Keeping Track of MTSAT! (in Japanese). The following briefly summarizes the chronology of the launch of MTSAT-1R, although most links (simply written as "Link") are written in Japanese. 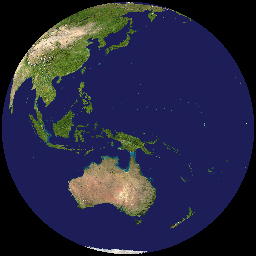 On June 28, 2005, the geostationary meteorolgical satellite of Japan is switched over to Himawari-6 (MTSAT-1R). The satellite has been GOES-9 since May 22, 2003, but the satellite now returned to the series of "Himawari" satellites. Other latest information about Himawari-6 is also updated at Keeping Track of MTSAT! (in Japanese). The success of the launch of MTSAT-1R by the H-IIA F7 Rocket Link1 :: Link2 :: Link3 :: Keeping Track of MTSAT! The reach of MTSAT-1R to the geostationary trajectory and the decision of its nickname to "Himawari-6" Link2 :: Keeping Track of MTSAT! The success of the launch of MTSAT-2 by the H-IIA F9 Rocket Link1 :: Launch Result of the Multi-functional Transport Satellite 2 (MTSAT-2) by the H-IIA Launch Vehicle No.9 (H-IIA F9) :: Keeping Track of MTSAT! First images from MTSAT-2 (Himawari-7) First images from MTSAT-2 :: First images from MTSAT-2 :: Keeping Track of MTSAT! Japan Meteorological Agency. Information on MTSAT series that are now being used as "Himawari" meteorological satellites. Popular meteorological satellite in Japan for weather forecast. An introductory page from NASDA. Meteorological Satellite Center (JMA). Information about GMS satellite. World Meteorological Organization (WMO). Operational meteorological satellites in the world. Images, Data Books and FAQ about GOES Project. The History of GOES Project. National Oceanic and Atmospheric Administration. A brief summary of meteorological / weather satellites (geostationary and polar-orbiting) in the United States. Weather Forecast in a Pinch? Asahi Shimbun. Available in Japanese. Mainichi Shimbun. Available in Japanese. The collection of press releases from NASDA about the failure of launch of MTSAT. JAXA's main site about the H-IIA rocket. Opinions on technical problems of MTSAT.